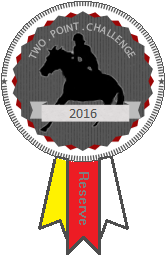 While some people are fortunate enough to have Living Quarters or pull their horse trailers with RVs, we just have our camper topper. In order to shower, we’ve had to get a little creative. 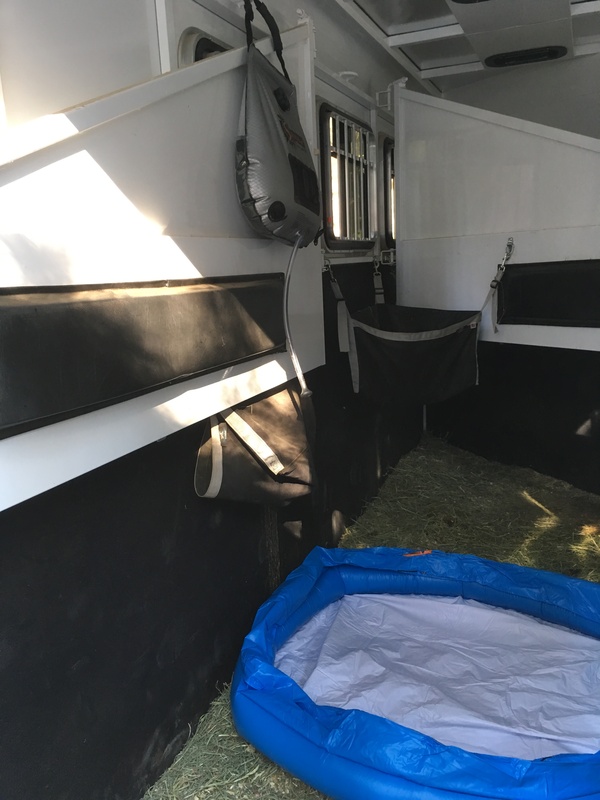 One of the great things about our solution is that it works for anyone who has a horse trailer whether you sleep in a tent or an gooseneck or in the back of your car. You don’t need to do any installation work on your trailer and can set this up y yourself. 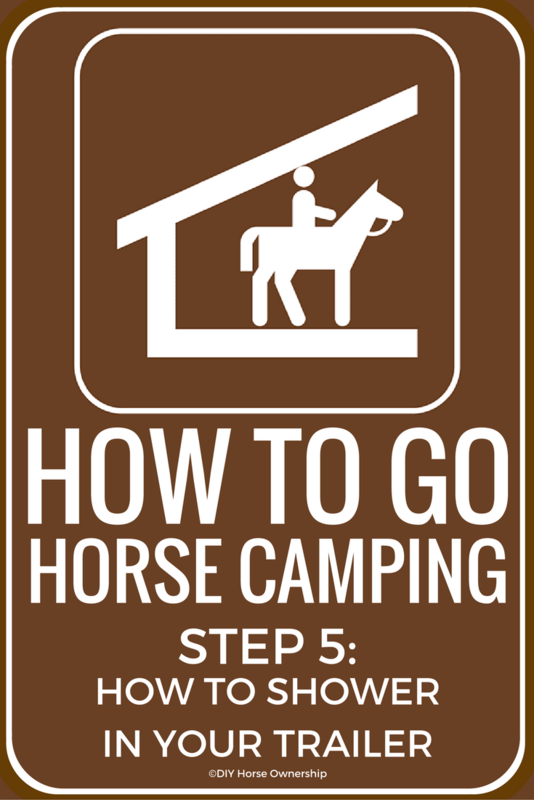 This will also work for people sleeping over at horse shows and events, not just for campers. Inflatable kiddie pool – we bought one on sale for $7.50. Feel free to get a cheapie. First, fill your solar shower and set it out in the sun. We usually fill it in the morning and leave it to heat while we’re out riding. Once the water’s hot, hang your solar shower in your trailer and place your inflated kiddie pool beneath it. We use the bungee cord to keep our trailer door shut as it doesn’t have a handle on the inside. 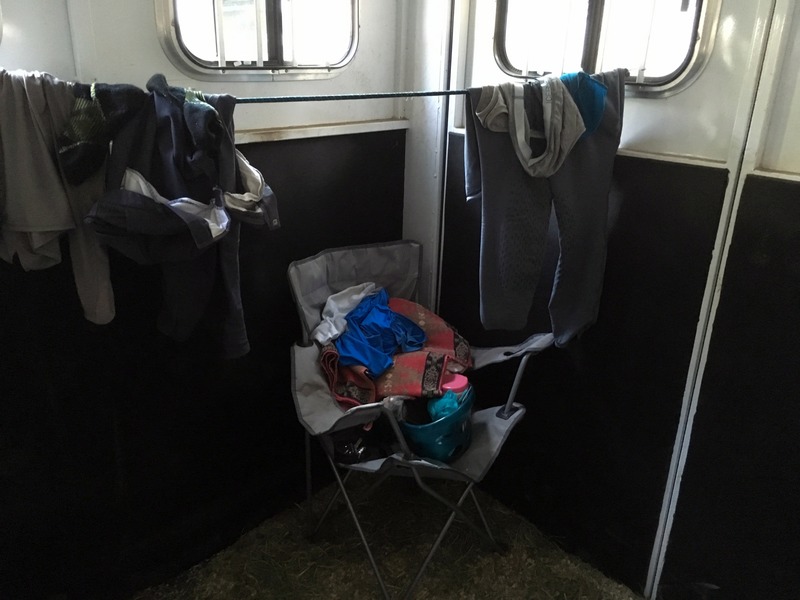 As a bonus, it works great as a clothesline for your dirty clothes. We use the chair to hold clean clothes and our toiletries. You could use a bucket or other stand for this. When you’re done showering, you can dump out the water in the kiddie pool and this saves your trailer floor from getting wet. You are a genius. I’m getting a solar shower- I never could figure out how to use it without traumatizing people but this would totally work! Yes, it’s great for privacy. Great idea. How much water does it hold? Is it enough for both of you to rinse off? Can you actually wash your hair or would you run out of water? It is enough for both of us. I never wash my hair, but my husband does his. It might have enough water for someone with normal hair, but I have really long, thick hair, which is annoying to wash even in a normal shower and I don’t trust this to have enough water/force. used one of these when i went to bonnaroo – we actually didnt leave it out to cook all day bc it was soooo hot the cold water actually felt pretty good. the kiddie pool is a solid idea tho! Our water this weekend was so hot we had to add extra cold water to bring it down to warm. How the hell did I miss these before our first camping trip this weekend?! Going to have to go back and read everything… Luckily we only went for one night. Super smart! I hope you had a fun trip anyway! Those solar water bags can get toasty – any way to mix some cool water in too? Yes, we actually had to do that this weekend. Just drain some hot water out and add some cold into the top. Definitely adding this to my wish list! They’re cheap and make a great addition. Very interesting idea. I will have to keep this in mind for when I start having to go to overnight shows. The kiddie pool makes so much sense. I’ve seen people showering in their trailer without it and just sweeping the water out after, but I don’t want water on my trailer floor at all, so the kiddie pool helps a lot. I’m not really one for camping. I would come home as one gigantic mosquito bite and afflicted with Zika. I’m sure of it. However, this solar shower is genius! My little brother lives more or less off-grid. He has no running water. His “shower” involves heating water on the propane stove and then holding a colander over his head… He’s definitely getting one of these for his birthday! Umm… Not sure how to process that. But I hope he likes the solar shower. That’s a good suggestion. We just added some water from the stock tank to cool it down. The bag said it was 122 before the extra cold water.